If there’s one activity that makes us acutely aware of time, it’s traveling—especially air travel. What time is my flight? How many hours before my departure do I have to be at the airport? How long does it take to get to the airport? What time do I land? What’s the time difference between my destination time zone and my home time zone? What time do I have to be at the gate? These are just a few of the time-related questions that race through our head prior to and during travel. And while there are some who depend on their smartphones to keep track of the time, as Rolex enthusiasts we, of course, rely on our infinitely more stylish Rolex watches to do that. But what makes a good traveling Rolex watch? We like stainless steel ones for their robustness and if they have an extra time zone indicator, even better. Here are three of our favorites. The GMT is one of the best traveling companions for its ability to track multiple time zones. The GMT-Master was born to travel—literally. As most of you probably know, in the 1950s Pan Am commissioned a tool watch from Rolex for pilots to wear during their flights. The watch had to be able to indicate GMT time and local time simultaneously and Rolex obliged with the GMT-Master watch in 1955. 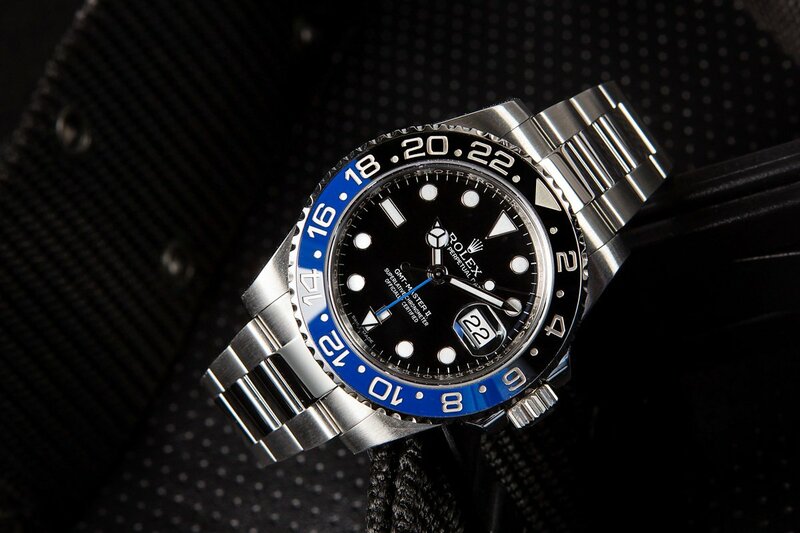 Fast forward about six decades, and one of the most popular Rolex sports models today is the GMT-Master II ref. 116710BLNR, also known as “Batman” thanks to its black and blue colorway. As a travel companion, it checks off all the boxes. First, there’s the super durable stainless steel 40mm Oyster case and matching steel Oyster bracelet. Then there’s the scratch-resistant Cerachrom ceramic bezel split by color into day and night hours. And finally, there’s the GMT function that allows wearers to keep track of three time zones. Local time via the center hands, home time via the extra 24-hour hand pointing to the bezel, and the ability to read a third time zone with a couple of clicks of the bezel. The Sky-Dweller is a complex watch for the complex traveling man. 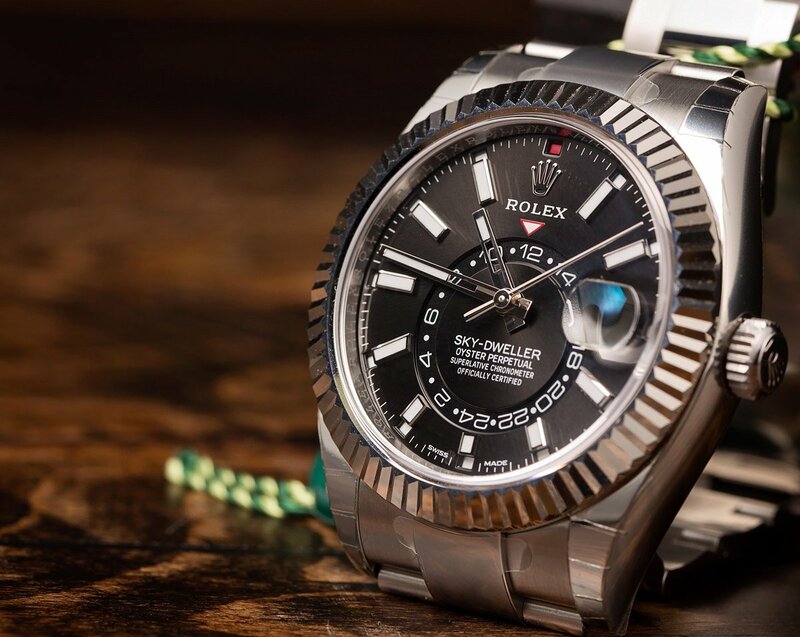 The Sky-Dweller only joined the Rolex catalog in 2012, making it the newest model from the brand. As its name suggests, the Sky-Dweller was created for those who spend a lot of time traveling. Not only is the Sky-Dweller an annual calendar equipped with the date and month, but it also indicates an extra time zone on the 24-hour disc on the dial—perfect for jet setters who frequently find themselves in another city. While the Sky-Dweller was initially only available in gold, last year Rolex introduced the stainless steel Sky-Dweller ref. 326934. Accompanying the stainless steel 42mm Oyster case and steel Oyster bracelet, however, is an 18k white gold bezel. And that fluted bezel isn’t just there for a stylish touch, but it’s in fact how the wearer chooses between the date, 24-hour time, and center time functions to adjust them, hence its name, the Ring Command Bezel. The Daytona is not your typical traveling watch, but it is still an amazing timepiece. Presented in 2016, the Daytona ref. 116500 quickly became the must-have luxury watch. Almost two Baselworlds later and the waitlists to get this coveted chronograph are still years-long. 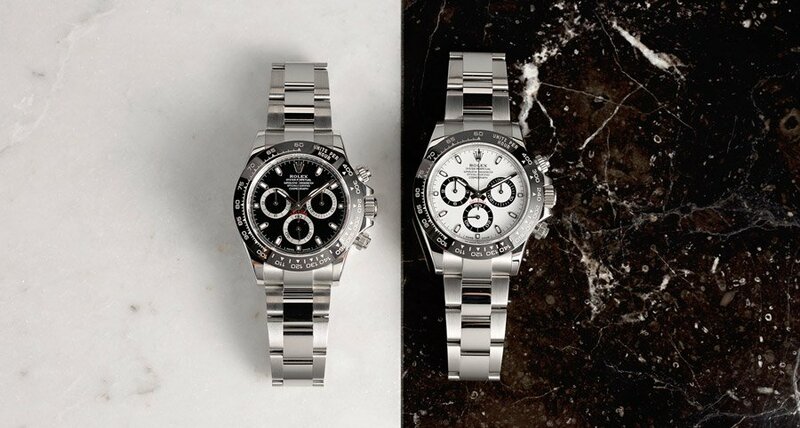 Although the Rolex Daytona ref. 116500 does not include an additional time zone indicator, it’s still one of our favorites to travel with since it’s such a fine looking watch! Plus, this version of Rolex’s signature chronograph sports a tough stainless steel 40mm Oyster case, a sturdy steel Oyster bracelet, and the coveted scratch-resistant Cerachrom ceramic bezel. Travel the skies in style with the Daytona C.
Depending on the airport, some security personnel will ask you to remove your watch prior to the x-ray machine and some will not. To make sure that nothing happens to your cherished Rolex, we would recommend stashing it in your carry-on (safely in a traveling watch roll of course) before arriving at the security line. Better safe than sorry! What’s your go-to Rolex watch to travel with? Leave us your thoughts and share your pictures with us in the comment section below.